A lovely gift set consisting of 2 baby hooded bath towels and 2 washcloths. Perfect for a baby shower or newborn gift. Your package will normally be dispatched via Royal Mail 2nd class or myHermes on the same or next working day after cleared funds. We always confirm via email that your item has been shipped. Free delivery is available in the UK only on all orders and will normally get delivered within 3-5 days. If you require faster shipping we offer an express delivery option. We are more than happy for you to return any of our goods for a refund or exchange within 30 days of receipt, as long as, they are in resellable condition with any packaging and labels intact. All costs for sending goods back are at the expense of the buyer and we do not cover those costs. 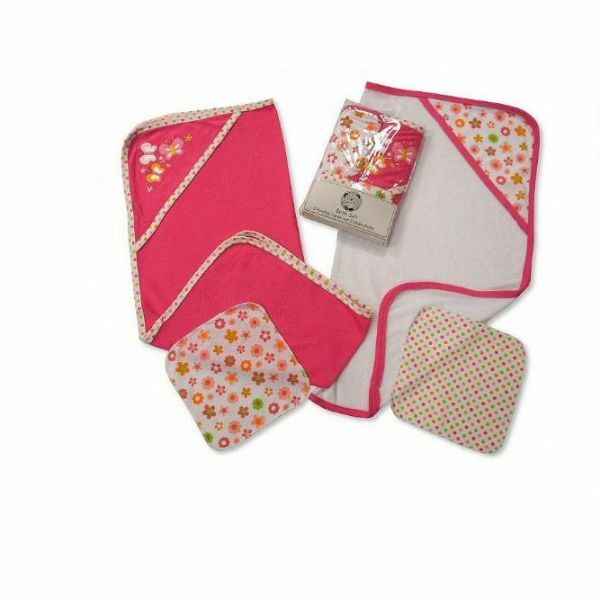 A lovely gift set consisting of 2 baby hooded towels and 2 washcloths. Perfect for a baby shower or gift. Superior quality hooded baby towel and washcloths. Warm, super soft and comfortable. Can be used at home or away on holiday with the kids. Copyright © 2018 H2Bees. All rights reserved.